Grab your sweater, maybe a blanket and get ready to sip on one of these ten fall cocktails. These are perfect to slowly sip on a cool, crisp fall evening. I have a hard time believing there’s anything better than fall. Except for fall-themed everything! The decorations, the makeup, the clothes, and even the drinks. From apple cider mimosas to ginger beer and whiskey, there’s a fall themed drink for everyone. Here are 10 fall themed cocktails you can whip up this season. This delicious drink is made with pumpkin spice Kahlua and butterscotch schnapps, a match made in heaven. Mix it with heavy cream and you have a perfect fall cocktail! Sprinkle some pumpkin spice on top for extra fall feels. Margarita fan? This one’s for you. This drink has a mix of tequila, spiced apple cider, and Grand Marnier, an orange flavored liqueur. Intense, right? Rim the glass with raw sugar and cinnamon for a boost of fall flavor. Also, garnish with cinnamon sticks and apple slices for a picture perfect fall drink. I’m convinced apple cider and champagne were made to be together. This drink only needs two ingredients, and if you want, you can decorate the rim with gold and silver sprinkles. Enjoy by yourself or with a group of girlfriends. Party! I always think of fall when I have a big cup of coffee in front of me, and this cocktail is perfect for a night by the campfire. Grey Goose vodka, espresso, and premium coffee liqueur come together to create this yummy drink, and you can even garnish it with salted dark chocolate powder! You didn’t think I forgot wine, did you? This mix of orange, cinnamon, honey, sugar, and cloves is another best of both worlds drink. The orange and cinnamon complement each other so well, and you can practically taste fall with the cinnamon and cloves added in. It can be served in heat-resistant cups or wine glasses. Thyme Will Tell (see what they did there?) is a mix of bourbon, maple syrup, lemon, and of course, thyme! It’s fresh and smoky flavors balance and blend perfectly. Since the whole thing is poured in muddled thyme, the flavor is all there instead of just a hint. I think I’d try this drink just for the pun alone. If fall doesn’t have caramel apples, it’s not fall. Plain and simple. 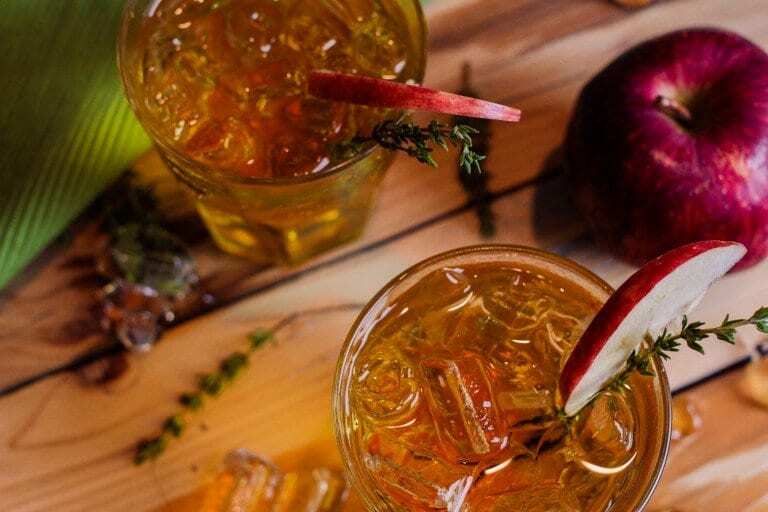 This cocktail brings together Absolut vodka, caramel syrup, and apple cider, and I can’t think of anything more delicious, to be honest. Top with ginger beer and garnish with a thin apple slice. How could I forget cranberry? This drink mixes fruity cranberry, zesty lime and crisp ginger beer for a balanced and delicious cocktail. Garnish each drink with fresh lime wedges, cranberry skewers, or a bit of rosemary to add another flavor to the mix. This is a simple, crisp cocktail which requires no mixing or fancy work. It only has three ingredients and can easily be dressed up with an apple slice and a sprig of thyme. Are you ready to whip up a fall cocktail for yourself or your guests? Fall is the perfect time of the year to practice your cocktail making skills. Have fun and cheers!